“Hey guys, as you know, we have been looking for a new office for quite some time now and it has been very frustrating. Rent rates keep soaring! 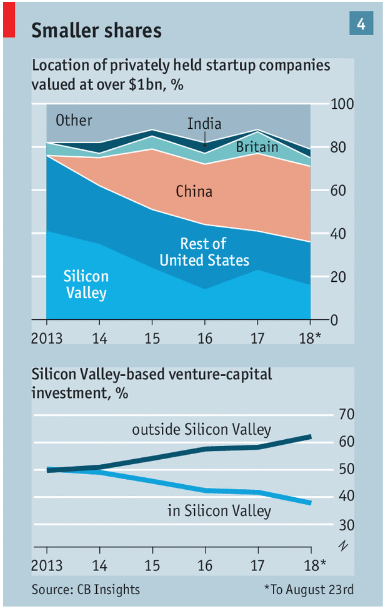 I thought about it and why don’t we move out of Silicon Valley?”. “Hell yeah. Let’s move out!”. This was more or less the conversation between myself (Riccardo) and comma employees at the beginning of January when we started to consider moving the company outside of Silicon Valley. 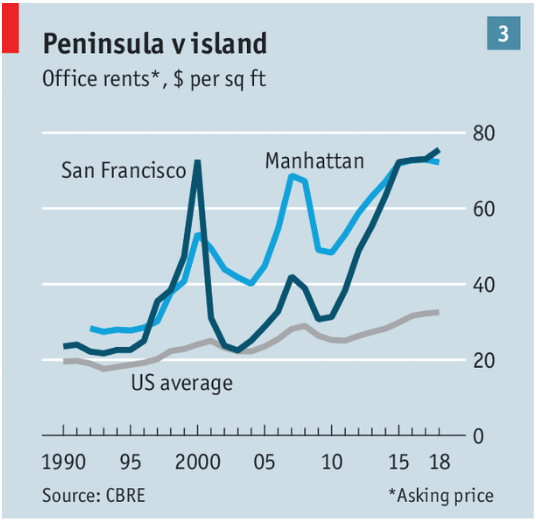 From: The Economist, “Silicon Valley is changing, and its lead over other tech hubs narrowing”, Sep 1st 2018. I didn’t need to explain my rationales for wanting to move. Most of us had been thinking about it for quite awhile. Paradoxes and contradictions of trying to establish a company in Silicon Valley were often discussed during company lunches, but we never actually realized relocating the company was a feasible option. Before getting serious about it, I individually talked with each of the 12 comma employees and, not too unsurprisingly, nobody was opposed to the move. Actually, almost everyone was very excited to leave the Valley. Being an employee in a startup in Silicon Valley is tough: you work hard and, unless the startup is backed by enormous capitals (and often unsustainable growth), your salary is significantly lower than what you could earn at either Google, Facebook or some other tech giant. In San Francisco, unless you make considerably more than $100k a year, you can barely sustain yourself. I don’t mean to sound spoiled, $100k is a lot of money, but take a look at the living expenses: remove taxes, $3700 a month for a 1 bedroom rent, bills, some extra living costs and at the end of the year your bank account balance will likely be pretty close to what it was the year before. Santa Barbara was dismissed due to the lack of an international airport and for being “too small”. Los Angeles and San Diego were the finalists. In the end, both employee popularity and executive decision put San Diego largely ahead. Why San Diego? Downtown, parks, beaches and an international airport are all within a 15 minutes drive. SDSU is also close and many more universities south of Santa Barbara are within a few hours drive. Cost of living in San Diego is estimated to be 42% lower than in San Francisco. In other words, a $100k salary in San Diego should feel like a $171k salary in San Francisco. There is a rising tech scene and Qualcomm is close by (and we love Qualcomm’s chips!). It took a couple of trips to San Diego to secure our office. Within our budget, we were able to find a place in downtown’s best neighborhood with garages and enough space to contain the company’s growth for the next 2 years. From left to right: the garage where comma started (Potrero Hill, San Francisco), our current residential office (West Portal, San Francisco) and our future office (Little Italy, San Diego). When I tell people we are moving comma to San Diego, the most common reaction is approval. An approval, though, is a lot easier to give than a critique, so it’s not statistically interesting. Among the critiques I get (which are by far more relevant), the two most common are “in San Diego it will be harder to hire” and “in San Diego it will be more difficult to raise money”. Let’s talk about them. Hiring: since comma was founded, we purposefully grew by no more than a handful of people each year. For the large majority, the employees we hired came from outside Silicon Valley. Indubitably, there are a lot of good SW engineers in Silicon Valley, but it’s a tiny portion in comparison to the whole world. We have tried to hire engineers from Silicon Valley, but only a few of them have made it through the hiring process. Raising money: at comma, we proudly consider ourselves different from the stereotypical Silicon Valley startup. Our first and second goals aren’t growth and raising more money (or being acquired). Rather, we want to achieve a sustainable business with the least amount of capital possible. If we succeed according to our plan, we might not need to raise money from VCs again. And if we need to, Silicon Valley is only a one hour flight away. The Bay Area remains the place where VCs are and I won’t argue that raising money in Silicon Valley isn’t easier than anywhere else. However, while VCs seem to be remaining in Silicon Valley, the same can’t be said about where the money is going (see below). Did we make the right choice by moving to San Diego? Time will tell, but for now we are all very excited and we can’t wait to start working at our new home. Follow us on Twitter or join our community on Discord. And…we’re also hiring!